I’m not talking here about an upper respiratory infection, or allergies. I’m talking about the hallways here on Sunday mornings, especially between services. You know, between services when scores of people stop to get a cup of coffee, and another two dozen people stop to chat with their friends, and parents of 300 children are passing each other in the hallway picking up their kids from Sunday school. Not to mention the lobby. Sometimes it is just plain hard to move from place to place! 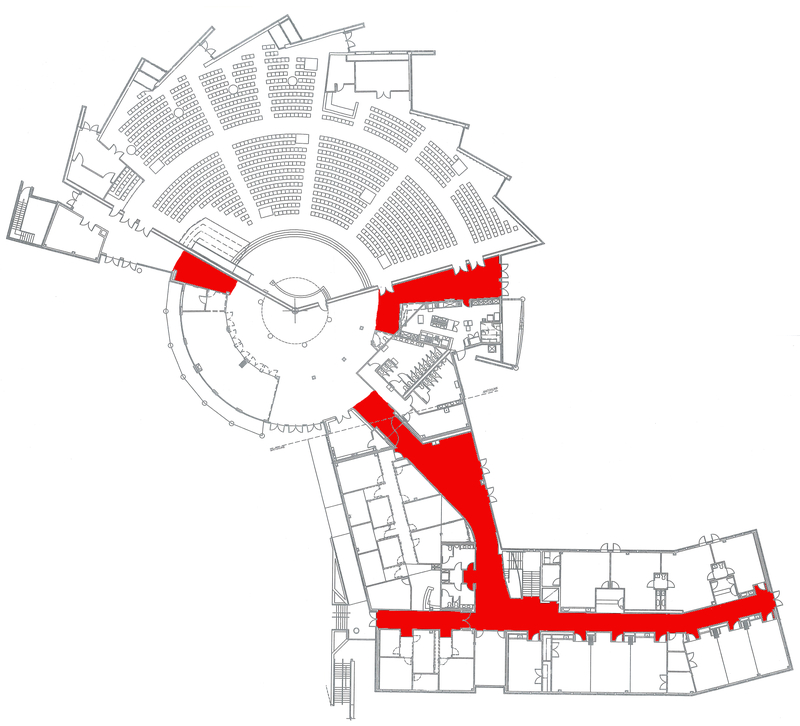 In the diagram below, you can see the hallways filled in with red. Basically everyplace there is red there is a certain amount of congestion on Sundays. Some areas are more congested at some times of the morning than at other times. We can’t solve all of the congestion problems with a renovation, but we do see relieving congestion as a need. Some ideas we have are doing away with the Fireside Room and expanding the lobby, and moving the coffee to that area; shaving off part of the corner by the kitchen to open up that corridor (and replacing that lost storage space in the kitchen with an expanded pantry); and extending the floor near the stairwell to provide more room for the children’s ministry information table without it encroaching on the hall so much. Since we are also planning to build a new building, there will be traffic pattern changes resulting from the relocation of some functions. For example, moving youth and adult education space to the new building may mean more people entering the current building through the corridor by the kitchen or the current coffee area; how will that impact the congestion? What will we need to do about that?